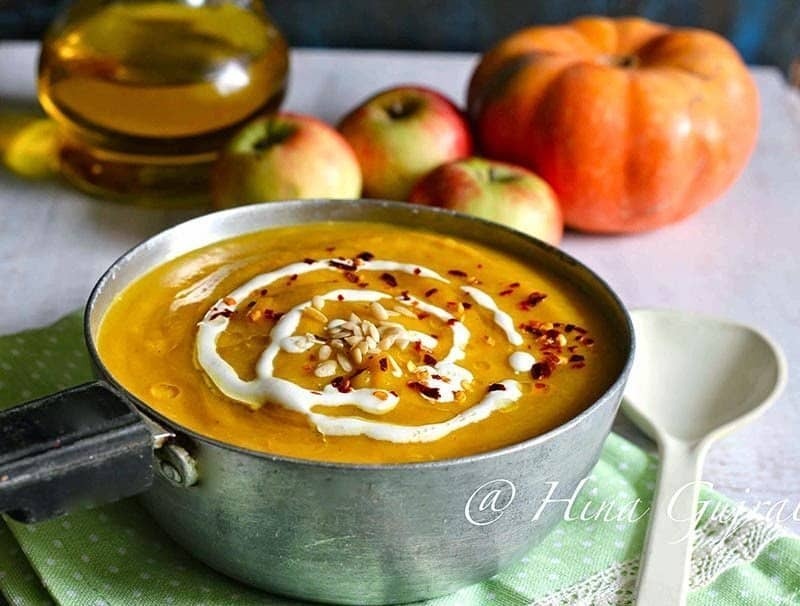 Curried Pumpkin Soup Recipe is packed with the goodness of pumpkin, carrot, and apple flavored with whole spices and a dash of curry powder. 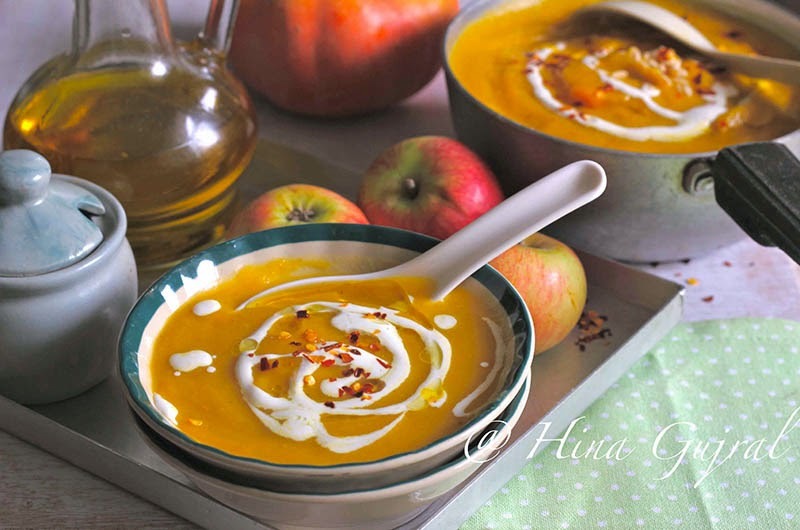 For the first time I tried apple in a soup and I really liked the taste, apple added a hint of tartness and sweetness to the flavor profile of the soup, which was complimenting the character of whole spices especially cinnamon. With winter breeze knocking at our door every now and then soups are the best comfort meal for this time of the year. Few days back after weeks, I had a day to myself, so to relax my overworked brain cells decided to make some soup. While the soup was simmering in the kitchen I watched my favorite American television drama series Gilmore Girls. The episode revolved around Thanksgiving and my craving for the soup increased double-fold. 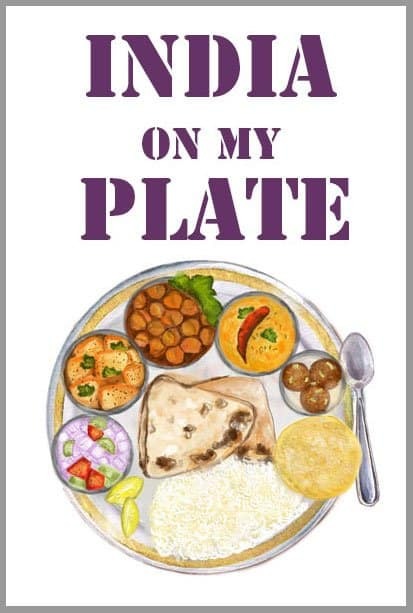 By the time episode got over soup was also ready but at a food blogger’s house first, your lens get the taste of the dish than at last you. 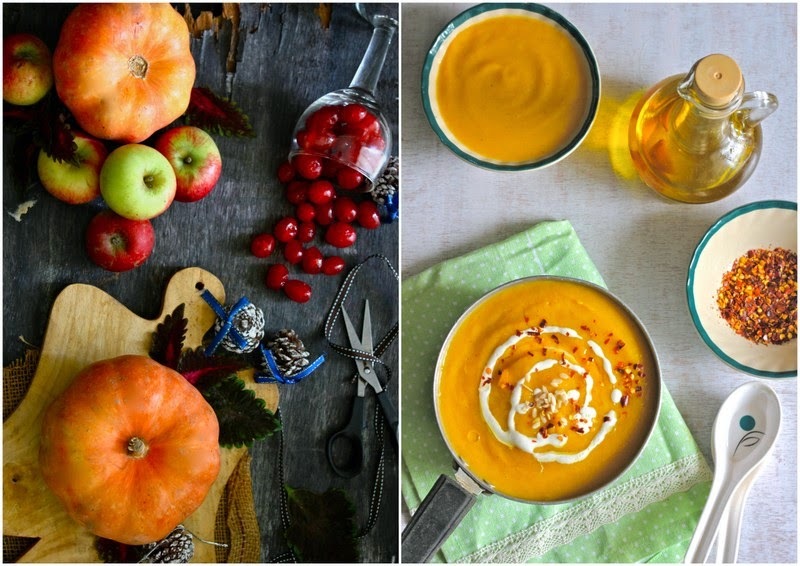 With whatever I could grab did some styling and shoot the Curried Pumpkin Soup. Once shooting part was over I helped myself with a bowl of it with some baked pita chips, by the time he came back from work I was already down two bowls and to give him company I joined in with another bowl of soup with a sheepish smile. But I didn’t have anything else for the dinner, which somehow justifies my soupy mania, anyways “he” too loved the soup and more than that he was impressed with the fact that soup has apple as well. The consistency of this soup is thick which makes it quite fulfilling and a great weeknight meal idea. 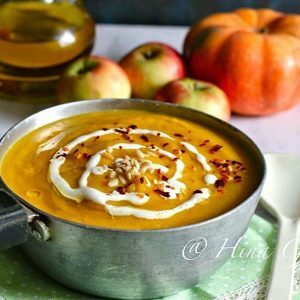 Curried Pumpkin Soup Recipe is packed with goodness of pumpkin, carrot and apple flavored with whole spices and a dash of curry powder. In a saucepan heat olive oil over medium heat. Add whole spices and saute until aroma is released. Add onion and garlic, saute until translucent but not brown. Now add carrot, saute for 4 – 5 minutes followed by pumpkin and apple. Season with salt and pepper, as per taste. Mix nicely. Add curry powder and hot vegetable stock. Bring the soup to rapid boil once and then reduce the flame to low. Let it simmer over medium heat until liquid is reduced to half and vegetables are tender. Remove whole spices from the soup. Puree the soup to smooth consistency in blender. While serving finish with tsp of cream, olive oil, sprinkle melon seeds and chili flakes on top. 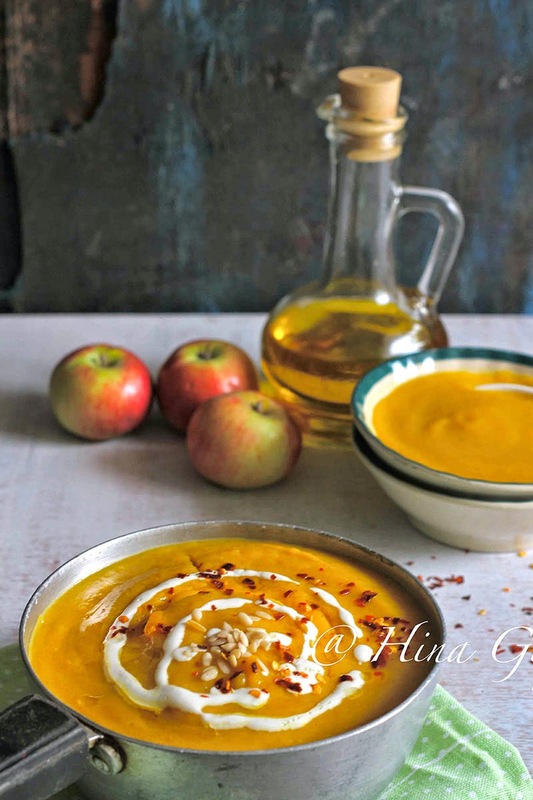 Serve Curried Pumpkin Soup warm.